On May 29, 2010, the Asian Canadian Writer’s Workshop hosted a community dinner at Foo's Ho Ho to celebrate the book launch of Henry Chow and Other Stories. 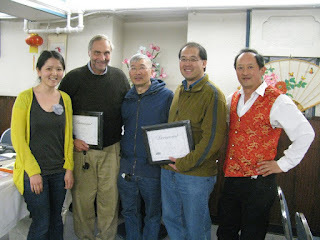 ACWW honoured community builders Marty Chan and Michael Katz. Marty Chan is a playwright, author and writer for radio and TV. Marty is best known as a playwright for Mom, Dad, I’m Living With a White Girl as well as writing for CBC Radio’s Dim Sum Diaries and appearing in CBC TV’s Jake and the Kid. He is also the writer of a series of young adult novels. Tradewind Books – publishers Michael Katz and Carol Frank. Michael Katz and Carol Frank have published many children and youth books addressing cultural diversity. Titles include Abby’s Birds, The Jade Necklace, Bamboo, What Happened This Summer and Henry Chow. The Bone Collector’s Son, by Paul Yee, is the only Children’s book to receive the Vancouver Book Prize. Both have made significant contributions to the Asian Canadian literary community. Past recipients of ACWW Community Awards are: Roy Mah, Wayson Choy, Paul Yee, Harvey Lowe, Roy Miki, Fred Wah, The Bulletin (National Association of Japanese Canadians), Joy Kogawa, Scott McIntyre and Gim Wong.